McNair compared protesting players to "inmates running the prison," and his team was predictably displeased. Player protests in the NFL seemed to have died down recently after reaching an apex last month, with only a handful of players across the league committed to kneeling or sitting during the national anthem in protest of institutional racism. But after Houston Texans owner Bob McNair was quoted by ESPN this week comparing players to “inmates running the prison,” the team’s players felt a grand demonstration was necessary. 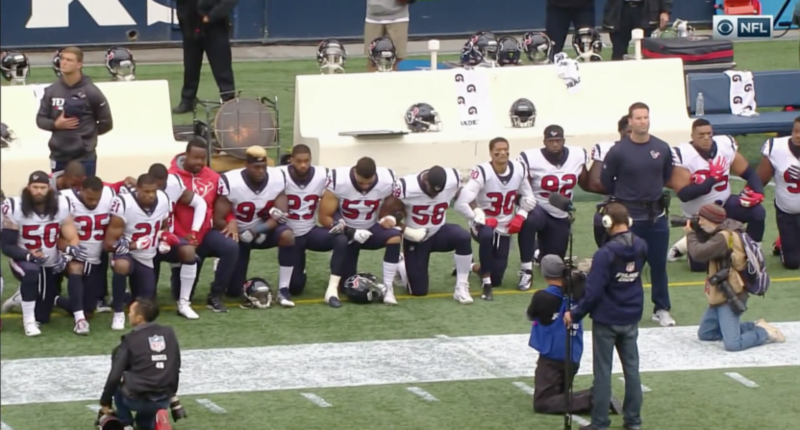 So before the Texans played the Seahawks on Sunday, several dozen Houston players knelt during the national anthem in one of the widest displays of protest we have seen yet. It was no secret entering Sunday that Texans players were angry over McNair’s comments. Star receiver DeAndre Hopkins failed to show up to practice Friday, and some of his teammates were reportedly upset enough to propose a walkout. McNair apologized for his “inmates” comment, but it was difficult not to read the remark as showing extreme disregard for protesting players, who have spoken out extensively about the need for criminal justice reform. McNair has reportedly been part of a hard-line group of owners that has lobbied for players to be panned from demonstrating during the national anthem.